This exquisite handmade challah cover is based on the “Rupan Plato design”, a very Guatemalan image that signifies the blessing of fruit and other foods. Brocaded in cream on cream, this challah cover is perfect for Shabbat dinner and other chagim. 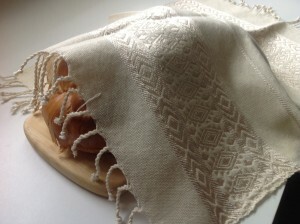 This handmade challah cover is woven by hand on treadle foot looms using cotton thread. It fits two loaves of challah. Wash in cold water and line dry. This product can be purchased online at MayaWorks’s store and at The Aesthetic Sense’s online store.